Sunday afternoon 11 December the past was brought to live at Centre Lambahoany. No less than eight groups of young rockers performed. It was a surprise that this music has so many followers in Toamasina, who with boundless energy sang, played, danced and jumped. The large crowd was young and just as enthusiastic. 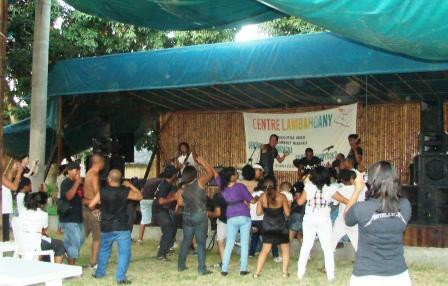 When the group NOCTURNAL was on stage they tried to besiege the stage, as if the sixties revived at Centre Lambahoany. A marvellous afternoon made possible by the organisation of young artists of Sylvain Rakoto. The tenrec, another remarkable mammal.